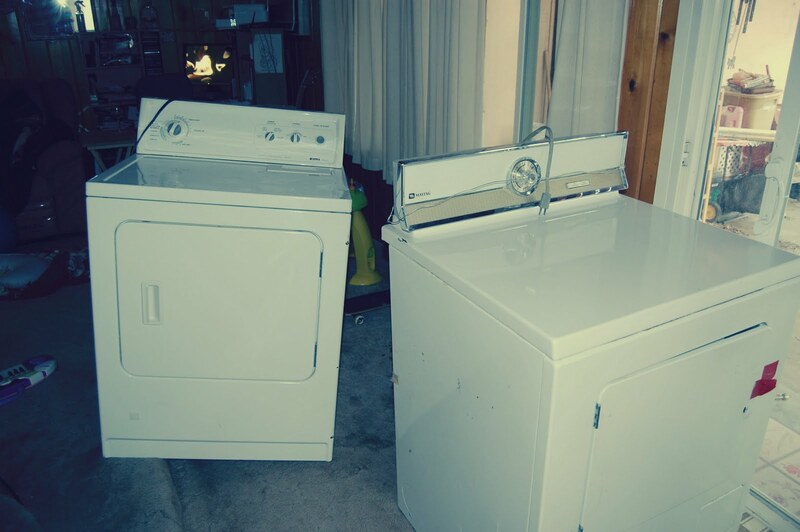 When we bought the house in 2004 it came with a washer and a dryer. Our best guess is that they are from the early 70's. There is a good chance that those appliances are older than Joey. AND THAT"S OLD PEOPLE!!! We knew it would be a matter of time, and that time finally came. The dryer broke on us. Being the lazy spoiled brats that we are, instead of hanging the clothes out to dryer, we packed up the kids and headed to Home Depot to price dryers. $350.00 for the cheapest gas dryer, so no dryer that day. We checked a few more places with the same price range. Which was out of our price range. Since we have been working hard to stay away from credit cards and (even more) debit we needed something we could afford in cash. So we made our first Craigslist purchase. 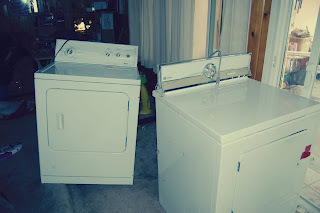 So for A LOT less than $350.00 we bought a used gas dryer. Joey brought it home and installed it. I half expected it to not work. But it did. And still is. Who knew. 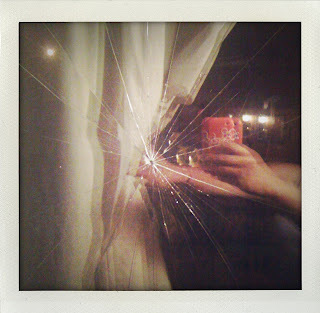 Not even 2 weeks later, yesterday to be more exact, I broke a window. There was a bee behind the curtain. I could see it's ugly little shadow. I have never been stung, and with all her allergies chances are The Phi is allergic to bee stings. So I grabbed one of Lou's plastic toys and went to smash the bee. I smack the curtain, missed the stupid bee, but hit the window hard enough to hear "crack". Luckily it is a small window, unluckily we have double-pane windows. Next up is going to be our water heater. It's days are numbered. Like I said, these are the days I wish we were renters. I was too scared to buy off craiglist so we went to the sears outlet.